When an earthquake rips through the afternoon lull, trapping these nine wildly individual characters together, their focus first jolts to a collective struggle to survive. There’s little food. The office begins to flood. 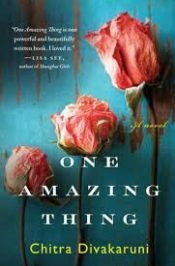 Then, at a moment when the psychological and emotional stress seems nearly too much for them to bear, the young graduate student suggests that each tell a personal tale, “one amazing thing” from their lives, which they have never told anyone before. As their surprising stories of romance, marriage, family, political upheaval, and self-discovery unfold against the urgency of their life-or-death circumstances, the novel proves the transcendent power of stories and the meaningfulness of human expression itself. One Amazing Thing is a passionate creation about survival—and about the reasons to survive. 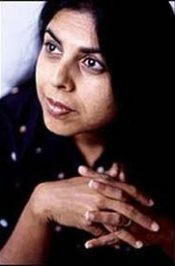 Chitra Banerjee Divakaruni is an award-winning author, poet and teacher of writing. Her work has been published in over 50 magazines, including the Atlantic Monthly and The New Yorker, and her writing has been included in over 50 anthologies. Her books have been translated into 29 languages, including Dutch, Hebrew and Japanese. Born in Kolkata, India, she came to the United States for her graduate studies, receiving a Master’s degree in English from Wright State University in Dayton, Ohio, and a Ph.D. from the University of California, Berkeley. To earn money for her education, she held many odd jobs, including babysitting, selling merchandise in an Indian boutique, slicing bread in a bakery, and washing instruments in a science lab. At Berkeley, she lived in the International House and worked in the dining hall. She briefly lived in Illinois and Ohio, but has spent most of her life in Northern California, which she often writes about. She currently lives in Houston, Texas. Divakaruni teaches in the nationally ranked Creative Writing program at the University of Houston. She serves on the Advisory board of Maitri in the San Francisco Bay Area and Daya in Houston. Both are organizations that help South Asian or South Asian American women who find themselves in abusive or domestic violence situations. She served on the board of Pratham, an organization that helps educate underprivileged children in India, for many years and is currently on their emeritus board. Two of her books, The Mistress of Spices and Sister of My Heart, have been made into movies by filmmakers Gurinder Chadha and Paul Berges (an English film) and Suhasini Mani Ratnam (a Tamil TV serial) respectively. Mistress of Spices was shortlisted for the Orange Prize. Divakaruni lives in Houston with her husband Murthy, her two sons Anand and Abhay (whose names she has used in her children’s novels) and Juno, the family dog. Submit an entry to OCUReads MUSINGS ... Creative relfecitons on One Amazing Thing. Cash prizes are awarded for entries in letters and arts!